After a first life filled with fun food, the stir-fried chickens have come home to roost. Getting older means my body burns calories at a much slower pace. Eating the way I used to also means weight gain and possibly worse. Over the past five months, my search for a better eating lifestyle led to losing 12 whole pounds. And then, gaining back seven. Ugh. Changing my relationship to food is tough because I’ve enjoyed decades of decadent deliciousness — from dim sum to four-star dinners. Now, there’s a new challenge on my plate. It is possible to savor good times at the dining table, lose weight AND keep it off? In other words, is it possible for me to have my cake and eat it too? Growing up in Chinatown raised me on the most incredible snack food and 10-course banquets. Dumplings, roast pork buns, noodles…I was always noshing. Journalists eat on the run. Plus, publicists wine and dine us in hopes of positive press coverage. So I’m trained to freeload. Bring on the free food and booze! One of the joys of motherhood is salvaging the kids’ leftovers. Their half-eaten pizzas and cookies became my comfort treats. Besides, tossing them felt like a sin. In January, these values waddled with me into Weight Watchers. Back then, I was desperate to follow my doctor’s orders. She wanted me to get down to 125 lbs. The weight loss would prevent the onset of diabetes, a terrible disease that runs strong and hard in my family. I needed to drop 16 lbs. At first, progress. As a people-pleasing good girl, I dutifully tracked every bite that went into my mouth and attended the half-hour, weekly support meetings. 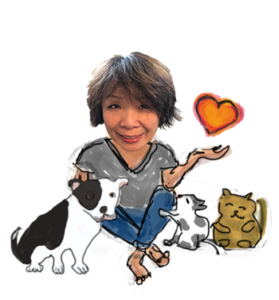 I even raved about my progress in a happy blog post. My clothes fit like clothes again, not like sausage casing. The aching in my knees went away too. Then, with only four pounds left to lose, I snapped. Impatient for results, I took short cuts. Showing up late for Weight Watcher meetings led to skipping them altogether. Guilty nibbling escalated until my Moment of Shame. That was me at the NYU reception for graduating students. Me, the faculty member circling the sushi and cheese trays. Me again, digging into a brick-sized chunk of strawberry shortcake and doggie bagging a second helping that disappeared as soon as I got home. All my food cultures screamed for control — the attraction to snacking, free food and leftovers. Make a meal last at least 20 minutes. Eliminate distractions; swap out the TV for soothing music. Give each bite an extra chew. Eat things I really enjoy. Put the fork down to talk or sip water. Set the table; candles or flowers maybe? Eat from a plate or bowl, not storage containers. Eat and drink the way I would if I was with a friend. Me, myself and I — the idea of making friends with myself seems key, especially when dining alone or at home. But after timing my food forays, I was shocked. While cooking a meal might involve at least 30 minutes, I was clearing my plate in under five. Eating at this pace is ridiculous, even for a fast eater. Where is the pleasure? I’m learning to make breakfast last nearly 8 minutes and 51 seconds. To stretch it out that long — and yes, it feels long — I turn off the TV and eat slowly. 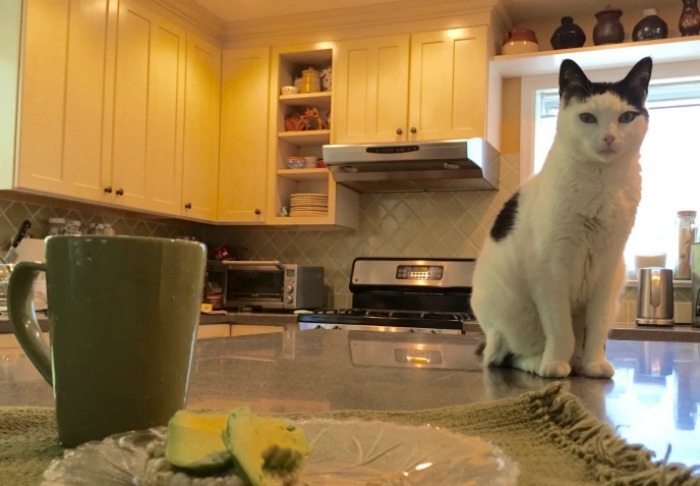 I put down the spoon a few times to sip water, and pet Minty, the cat. But when I’m not paying attention, it’s easy to slip back into the old rush-rush. The other night, I had to leave the house at 7 p.m. and waited until the last minute to eat. Darn. How could I make it seem special? Defeat seemed certain. Then, an idea. 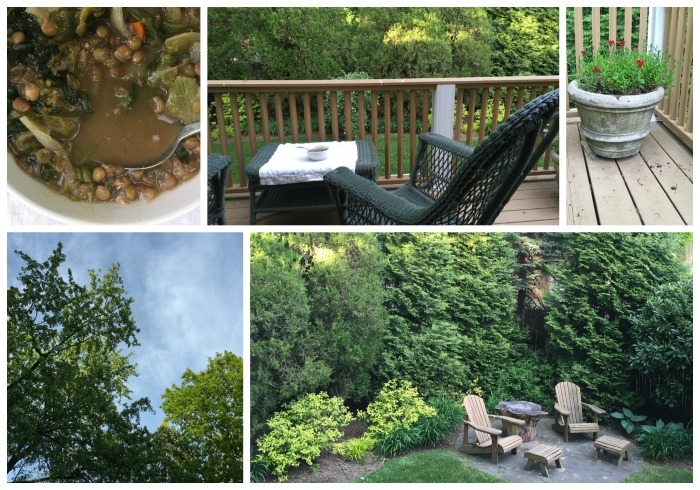 I took my leftover lentil soup and sat on the deck, where nature nurtured me with chirping birds and rustling trees. The five-minute dinner managed to soothe after all. I’m also trying to make eating moments an occasion, even if it’s just a snack. A placemat helps define the moment. So does putting food on a plate instead of the usual grab-and-go. By arranging my avocado and rice cake in an appealing way, I managed to munch for 6.5 minutes. Isabelle, our other cat, approved. The ability to fully occupy personal space is important. Students hear me talk about this all the time. In journalism classes, we learn that reporters must be comfortable moving around and interacting with others. In speech communication classes, public speaking techniques include hand gestures that emphasize our points. Now I need to apply these body movement ideas to food moments. It matters whether I stand in front of the fridge and eat out of storage containers or set a place at the table. How and where I sit matters too. Consider my aha! kitchen moment. The island counter only seats three. My daughter and boyfriend each sit at the end chairs, with an empty chair between them. Meanwhile, I’m the self-sacrificing mommy martyr, perched on a stool, jumping up to selflessly serve others. No one told me to do this. It just always seemed “natural.” Even when home alone, I stick to the stool. Why don’t I ever sit in a real chair? And why am I waiting on everyone, anyway? Given our busy lives, the three of us have yet to dine together since my epiphany. 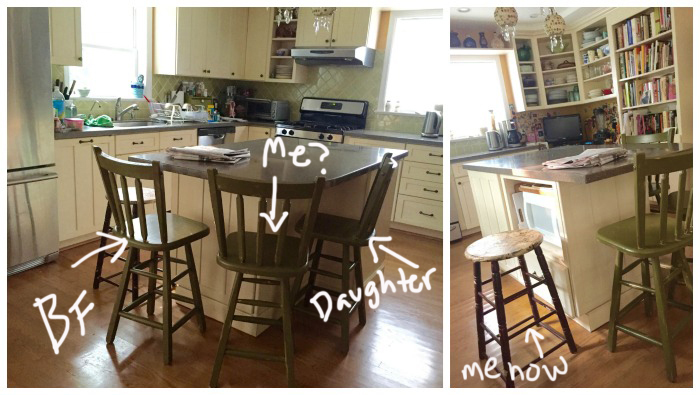 But when they’re not home, I’ve been trying out their chairs — and discovering that each one offering me a different, unfamiliar view of the kitchen. I’m wondering if I’ll like sitting in the middle chair with them. Or, if things feel too cramped, when we’ll start using the dining table. I wish I’d discover these various options sooner. With greater self-awareness on the menu, I would’ve been more emotionally centered in my 20s through the early 50s. But maybe I wasn’t there yet. Like prepping for a great meal, maybe other ingredients had to be gathered first. Instead of playing Chinese woman-slave, take my place at the table, in a real chair. Instead of shoving food on busy days, proceed calmly and savor even quick bites. Instead of indiscriminately grabbing freebies, take only the best and skip the rest. My daughter can eat her own leftovers. Or, not. Let’s both break the fat head cycle! Surely, these goals can lead to a happy, diabetes-free second life. My new food adventure boils down to one word: commitment. Commitment to treating myself well. great ideas for those in a life-long struggle with weight control. I eat way too fast also. Find if I am reading I don’t even realize that I’ve eaten! !